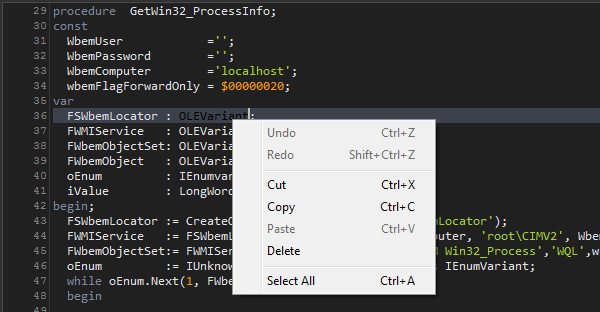 When you uses an Edit control like a TMemo or TEdit component a context menu pops up with options to undo, copy, paste, select all, etc. 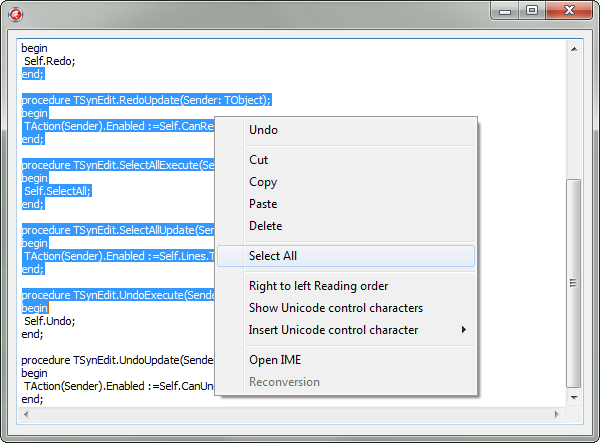 Unfortunally the TSynEdit component doesn’t include a menu like this, so you must write you own. You can fix this in a few lines of code using a interposer class. Check this unit which implements a standard context menu for a TSynEdit component, based on a TActionList (only be sure to include the uSynEditPopupEdit unit after of the SynEdit unit in your uses list). Categories: Delphi | Tags: Delphi | Permalink. How about the CUA shortcuts? That does not include the unicode and IME menu items! No for now, but you can expand the unit as you wish. I know this topic is quite old. But since it’s still a valid solution I’d like to add an improvement that I implemented after running into some irritating problems. Your current implementation creates “global” hotkeys that grab all normal keyboard actions (like Ctrl+V) to the SynEdit, even if the focus is in a totaly different control. Also it pastes inside a disabled SynEdit. That way the hotkeys become only active if the focus is inside the SynEdit. Just wanted to give something back to you. Thanks for all your Delphi work! Thank you RRUZ. That was a great help to me.